Updated 01-05-13. The other day I was chatting with my Phở buddy Tim and something interesting came up. The subject was pho obviously, but the context was "what is pho?" or more precisely, "what Vietnamese soupy noodle dish can be considered pho?" Because there are so many varieties of Vietnamese noodle dishes, many of them using the same noodle and similar looking broth, it can be confusing for newbies. Well I'm here to set the record straight once and for all. Not all Vietnamese-noodle-in-hot-broth-in-a-bowl dishes are Phở. That's right. This simple phrase will alert non-Vietnamese to the possibility that what they're looking at may not be pho at all. If you remember just this phrase, plus a couple of tips I'll give at the end of this post, then you'll stay out of pho hell for sure, plus you'll be able to identify pho or otherwise a different type of noodle dish like a pro, or a true Vietnamese, or a pho connoisseur, whichever applies. Let's look at a few examples below, but don't look too long because you'll get nauseated knowing you can't have a bowl right now. Below are pho bo and pho ga (beef pho and chicken pho). These are chicken pho - side chicken and dipping fish sauce optional. And these below are not pho. 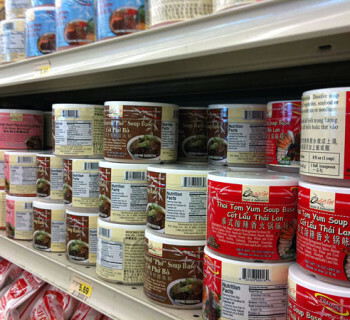 They're various other kinds of noodle with their own names such as hu tieu and bun bo Hue. They cannot be called pho, in the same sense that sashimi cannot be called sushi. Since you're viewing this post on a computer and they haven't yet invented a way to smell/sniff what you're looking at on the screen, too bad we can't decide based on aroma as an indicator (although if you can, it's one of the best way to identify pho even with eyes closed). You can't mistake pho's aroma. One little whiff and you'll know it's pho. If you don't have beef or chicken, then it's not pho. If you have fish, shrimp, pork, octopus, goat, etc., then it's not pho. Pho can be ordered without meats, or with meats on the side (e.g., rare beef, chicken or beef balls) in which case you'll need to validate by some other ways. Pho chay (vegetarian pho) which is normally served at Buddhist temples, vegetarian restaurants, or at many regular pho places. Pho chay looks and tastes somewhat different from the real pho, but it is considered pho regardless. If you're at a restaurant and the menu specifically says such pho dish is a specially created dish, or otherwise acknowledging in some way that it's not a regular pho, because they have meats other than beef or chicken in it, then conditions 1. and 2. above can be relaxed. The idea here is a chef has every right to be creative with his/her food, and if the chef makes a clear distinction of what is authentic pho and what falls under the creative license arena, then it is totally acceptable. For an example of such case, head on over and read Tim's post on Baltimore Pho. You'll enjoy it. So there you have it. I think it's important to distinguish real pho from the misunderstood pho, because authenticity is important for cultural, social and institutional reasons. By the way, hu tieu and bun bo Hue are also two of my favorite Vietnamese noodle dishes - love to eat them every chance I get. What's been your own experience on pho-looking pho and non-pho looking pho? (hope that makes sense). Share with us your opinions. Great post Cuong! This is very informative as even I didn’t know the difference until you educated me. I just recently visited a Pho restaurant in Atlantic City that had chicken “hu tieu.” I would have never known this wasn’t considered Pho. Thanks Tim. Maybe I’ll post one about hu tieu, as they’re many types as well. Hu tieu can be considered a cousin of pho, originating from the south as opposed to pho from the north. Hu tieu varieties are very good too. Too much good food, too little time. But be careful. You may want to try it, then like it too. 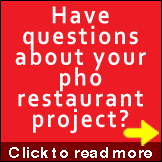 After your experience with pho in Atlantic City who knows what will happen? I agree with you Kim: she’s using the mien glass noodle. I don’t think there’s a name for what she’s making though. Of course there are other videos of bad pho, but I found so many things wrong with this one so that’s why it is featured here. 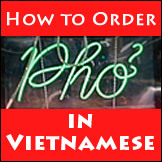 Hello, we at OneVietnam Network are going to borrow your Pho Ga picture for our newest blog entry on Pho. We will give you credit for it. Our websited is http://talk.onevietnam.org. Let me know if this is a problem. Thank you so much. with lovingpho.com linking back to https://www.lovingpho.com. Hi Alice: Ouch, Cringe, Ouch! I guess this is the risk of going mainstream, isn’t it? That is to say, once a certain ethnic food is heading toward being accepted by the mass outside of that ethnic community, then really anything goes. I like a lot of things the Food Network “experts” do, but there are times when authenticity is out the door giving place to entertainment value, or “education” to the mainstream. Thanks for stopping by with your comment! Hi Ryan: Wow! so many questions in so few sentences 😉 I’ll try my best to answer them. Seafood pho: There is no seafood pho traditionally. My guess is restaurants made up seafood pho to serve those non-Viet clients who request something other than red meat or chicken. Fat noodle: The fat or wide noodles are popular in certain regions only, and are not used throughout Vietnam. In the North the wide banh pho (the pho noodle) is used mostly, whereas in the South Vietnam the narrower banh pho is more popular. Chicken pho with beef broth: I would say this shows the laziness/lack of care on the restaurant’s part to properly prepare and serve the proper chicken pho. Side dish of white onion/vinegar: This is certainly popular for many to enjoy their pho with. Personally I don’t care much for it, but others swear by it each and every time they eat pho. Oil with big onions: I’m not sure what this is that you described. Maybe you can elaborate on the oil and the big onions. I’ve never heard of or seen it. @Cracker: not sure what you meant with vinegared garlic slices, but with respect to vinegared onions, I think it’s just a way for people to tone down on the strong onion taste, or for some reason they like to add sour element to pho. For me, I don’t see a reason for it and I think it doesn’t add anything to improve pho. It just makes pho unnecessarily elaborate and complex. Hi there. I was introduced to Pho about a year ago after a Vietnamese coworker of mine persuaded me to give it a try. I’ve been hooked ever since. Considering I’m in Colorado and am plagued with colds and flu a lot…I decided to see if it would cure my ailment…and it seems like it works ever time. 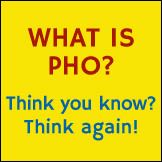 My question to you is…does Pho have any health attributes?? Hi jessicaindenver: Pho having health attributes? Hmmm hard to say. I don’t think there’s any scientific proof in any way. No one can claim that pho can help with your health, but one thing for sure: pho is an excellent hangover cure! Many college students and others can attest to it, but again, no scientific proof 😉 But seriously, to me, pho is hearty, wholesome, and full of goodness that when I finish a bowl of pho, I always feel great and revitalized regardless of how I felt before eating it. And that’s good enough for me. Sounds like pho did the same thing to you. Hi Jacki: You should try to make it yourself, it’s not that hard to do. It may not be that much more difficult than some of the Hispanic soups or dishes that you may have made. With respect to the shrimp, it’s probably just a topping ingredients you’re referring to. Granted there are many Viet restaurants offering shrimp pho, but really, they’re just some shrimps on top of chicken or beef pho instead of the chicken or the beef. The idea for pho is chicken pho has chicken broth and chicken meats, and beef pho has beef broth and beef meats. Vietnamese do eat noodle with shrimp in broth and they are called hủ tiếu (see my article on Hu Tieu or Hủ Tiếu – Paying Respect to Pho’s Cousin). In any case, we do have customers who love to order pho with beef broth and vegan toppings. So customer preference can run the gamut given the choice. Looks like you found your choice. Joe: YES OF COURSE, it’s nước béo hành trần, which is “fatty broth with blanched onions” normally served in a smaller bowl on the side. 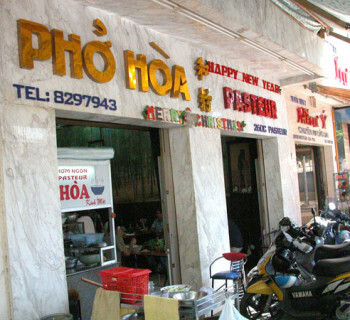 I’ve mentioned this briefly in the article Tips on Ordering Pho Your Way: Just Tell Them What You Want, and provided pronunciation of nước béo as #20 in the article Pho Pronunciation – How to Order Pho in Vietnamese. Thanks for clarifying this mystery Joe. Traditionally, a complete Vietnamese meal normally consists of a vegetable main dish (normally stir fried but not always,) a “salty” meat/protein main dish (chicken, beef, fish, etc.,) and a soup/broth dish to be enjoyed by itself or over rice. 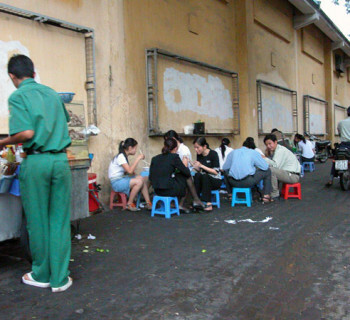 As many may already know, Vietnamese meals are normally communal in nature where the main dishes are placed in the center of the dining table (or floor, depending on if you’re poor or rich or somewhere in between) and each person would have his/her own rice bowl while they share these “entrees,” taking what they need as they enjoy the food. The soup/broth element becomes popular especially when you have non-soup entrees in a restaurant, from vermicelli with grilled pork, to broken rice with anything. It helps to wash down the main course with some nice hot soup. 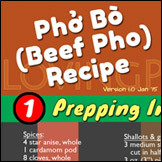 This practice is carried on over to pho, and while it is not really necessary to wash down pho with another bowl of soup/broth, the nuoc beo does allow those who love the fatty and tasty beef flavor to enhance their pho. I did love this myself, but stopped this practice in an effort to keep my pho on the healthy, lower fat/cholesterol side ;). Do you have any website where I can buy large bowls for PHO? I can not find them anywhere! Thanks! Today, I went out to lunch with my Vietnamese bros. I ordered the “shrimp pho” in hopes that I was abstaining from meat. Would this broth still be made from meat or is it completely meat-free? @dhalsim2: Shrimp pho and seafood pho are not standard pho types. They don’t exist as a pho dish. They are created by enterprising restaurateurs to sell more pho to people who don’t eat red meat. Sorry to say, what you got in you shrimp pho is anyone’s guess. If I have to guess, it’s probably using either beef or chicken broths. I would suggest the next time you go, ask for the vegan option/broth (of course if they have it) and specifically inquire about what’s in it. Thanks for the prompt advice. I’ll do some other sacrifice. It was tasty, and I tried my best based on my knowledge, so I have no regrets. It _did_ taste like the beef broth that I normally get, so I think that your guess is right.